Dr. Caroline Wanjiku Kihato Visiting Associate Professor at the Graduate School of Architecture at the University of Johannesburg. In 2011, she received a MacArthur grant on Migration and Development and spent a year as a Visiting Fellow at the Institute for the Study of International Migration (ISIM), Georgetown University, Washington DC. Her career has involved both teaching and conducting research in the academy and the non-profit sector in South Africa. Between 2006 and 2013 she worked for Urban LandMark as its southern African program coordinator. She was previously a Policy Analyst at the Development Bank of Southern Africa and a Senior Lecturer in the School of Architecture and Planning at the University of the Witwatersrand. She worked for six years as a Policy Analyst at the Centre for Policy Studies. 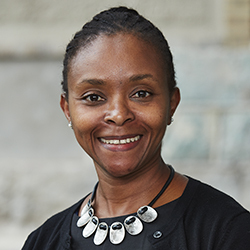 Her research and teaching interests are migration, gender, governance, and urbanization in the global South. She is part of a team developing an assessment tool to strengthen municipal responses to humanitarian crises in Nairobi, Kampala and Johannesburg. She is the author of Migrant Women of Johannesburg: Life in an in-between City (Palgrave Macmillan) and co-editor of Urban Diversity: Space, Culture and Inclusive Pluralism in Cities Worldwide (Johns Hopkins).